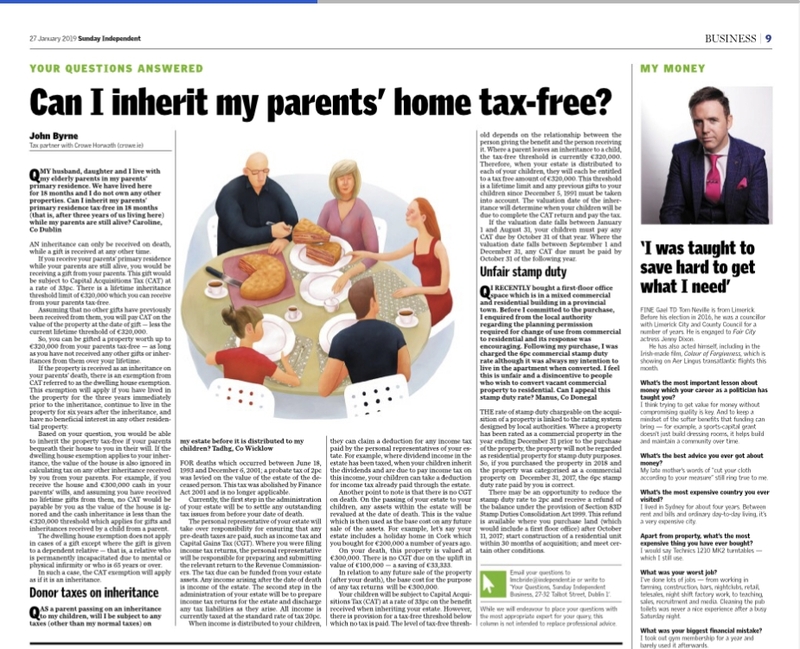 Crowe tax partner, John Byrne, answers Sunday Independent readers’ questions on inheritance tax. The following is an extract from the Personal Finance section from the 27 January edition of the Sunday Independent. Answer: An inheritance can only be received on death, while a gift is received at any other time. If you receive your parents’ primary residence while your parents are still alive, you would be receiving a gift from your parents. This gift would be subject to Capital Acquisitions Tax (CAT) at a rate of 33pc. There is a lifetime inheritance threshold limit of €320,000 which you can receive from your parents tax-free. Assuming that no other gifts have previously been received from them, you will pay CAT on the value of the property at the date of gift – less the current lifetime threshold of €320,000. So, you can be gifted a property worth up to €320,000 from your parents tax-free – as long as you have not received any other gifts or inheritances from them over your lifetime. If the property is received as an inheritance on your parents’ death, there is an exemption from CAT referred to as the dwelling house exemption. This exemption will apply if you have lived in the property for the three years immediately prior to the inheritance, continue to live in the property for six years after the inheritance, and have no beneficial interest in any other residential property. Based on your question, you would be able to inherit the property tax-free if your parents bequeath their house to you in their will. If the dwelling house exemption applies to your inheritance, the value of the house is also ignored in calculating tax on any other inheritance received by you from your parents. For example, if you receive the house and €300,000 cash in your parents’ wills, and assuming you have received no lifetime gifts from them, no CAT would be payable by you as the value of the house is ignored and the cash inheritance is less than the €320,000 threshold which applies for gifts and inheritances received by a child from a parent. The dwelling house exemption does not apply in cases of a gift except where the gift is given to a dependent relative – that is, a relative who is permanently incapacitated due to mental or physical infirmity or who is 65 years or over. In such a case, the CAT exemption will apply as if it is an inheritance. Answer: For deaths which occurred between June 18, 1993 and December 6, 2001; a probate tax of 2pc was levied on the value of the estate of the deceased person. This tax was abolished by Finance Act 2001 and is no longer applicable. Currently, the first step in the administration of your estate will be to settle any outstanding tax issues from before your date of death. The personal representative of your estate will take over responsibility for ensuring that any pre-death taxes are paid, such as income tax and Capital Gains Tax (CGT). Where you were filing income tax returns, the personal representative will be responsible for preparing and submitting the relevant return to the Revenue Commissioners. The tax due can be funded from your estate assets. Any income arising after the date of death is income of the estate. The second step in the administration of your estate will be to prepare income tax returns for the estate and discharge any tax liabilities as they arise. All income is currently taxed at the standard rate of tax 20pc. When income is distributed to your children, they can claim a deduction for any income tax paid by the personal representatives of your estate. For example, where dividend income in the estate has been taxed, when your children inherit the dividends and are due to pay income tax on this income, your children can take a deduction for income tax already paid through the estate. Another point to note is that there is no CGT on death. On the passing of your estate to your children, any assets within the estate will be revalued at the date of death. This is the value which is then used as the base cost on any future sale of the assets. For example, let’s say your estate includes a holiday home in Cork which you bought for €200,000 a number of years ago. On your death, this property is valued at €300,000. There is no CGT due on the uplift in value of €100,000 – a saving of €33,333. In relation to any future sale of the property (after your death), the base cost for the purpose of any tax returns will be €300,000. Your children will be subject to Capital Acquisitions Tax (CAT) at a rate of 33pc on the benefit received when inheriting your estate. However, there is provision for a tax-free threshold below which no tax is paid. The level of tax-free threshold depends on the relationship between the person giving the benefit and the person receiving it. Where a parent leaves an inheritance to a child, the tax-free threshold is currently €320,000. 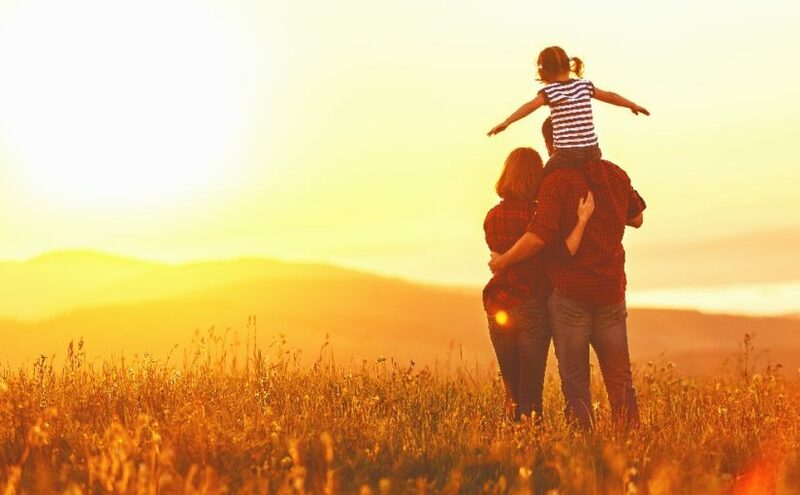 Therefore, when your estate is distributed to each of your children, they will each be entitled to a tax free amount of €320,000. This threshold is a lifetime limit and any previous gifts to your children since December 5, 1991 must be taken into account. The valuation date of the inheritance will determine when your children will be due to complete the CAT return and pay the tax. If the valuation date falls between January 1 and August 31, your children must pay any CAT due by October 31 of that year. Where the valuation date falls between September 1 and December 31, any CAT due must be paid by October 31 of the following year.